Christiane Hörr was born in Tokyo. Her enthusiasm for chamber music was awakened when she was still a child, as she grew up in a family of musicians. Her father is a violinist, her brother cellist, and so she began playing the viola in her family’s string trio at the age of 10. A frequent national prize winner in the “Jugend musiziert” Competition, she began her viola studies in Düsseldorf with Prof. Jürgen Kussmaul, completing them in Berlin with Prof. Bruno Giurama. Master classes with Ulrich Koch and Kim Kashkashian enriched her education, An academic study year sponsored by the DAAD (German Academic Exchange Service) brought her to Bloomington, Indiana in 1986/7. There followed an engagement in the Chamber Orchestra of Europe, marked by an intensive collaboration with Claudio Abbado and Nikolaus Harnoncourt. In 1990, she became a member of the Symphonieorchester des Bayerischen Rundfunks. As a member of the Consortium Classicum ensemble, she cperformed at international music festivals from 1992 to 2006 and took part in a number of CD projects. In 1992 and 1995, her children Julian and Sophia were born. 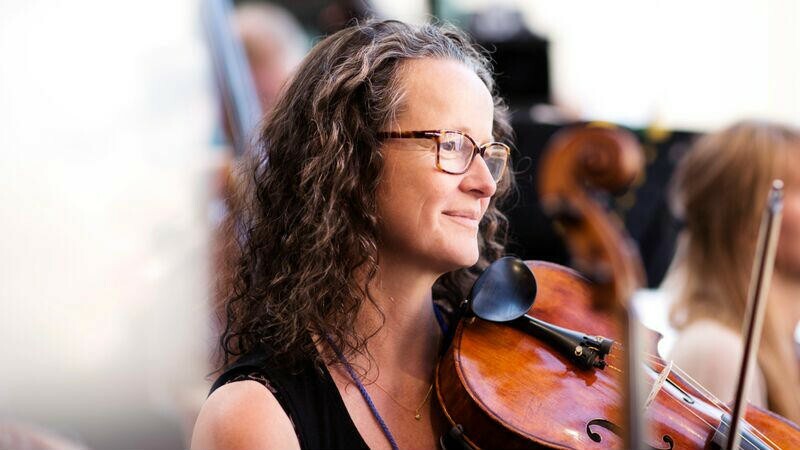 In 1998, she moved on to a position as deputy principal violist in the Münchner Rundfunkorchester, returning to the Symphonieorchester des Bayerischen Rundfunks in 2005. Then as now, her great love continues to be chamber music. In addition to her orchestral activity and family life, it presents a great challenge to her. She performs in a number of combinations and often plays some fairly unusual works. She is a member of the Orange String Quartet (strings and double bass, instead of cello), which concentrates on presenting their own arrangements in the jazz/classic/new music field. Since 2002 Christiane Hörr has devoted a lot of attention to her youth work. Repertoire projects with students from all kinds of schools and prisoners at the juvenile prison in Herrenwörth, as well as discussion workshops with schoolchildren, conductors, musicians and musicologists all encourage an involvement in the communication of classical music.